Big Data is a term for newly developed methods and technologies that enables to capture, store and perform analysis of a large and extended volume of differently structured and unstructured data. About two Zettabyte of data were produced worldwide in last year by the Internet users, mobile device users etc. and according to the study carried out, the data volume is doubling every two years. This raises the question : How can we use this data set in a better way? Is the innovation ofe “Big Data” really the answer to our question and it actually has a great importance not only for the IT industry, but also for industry and science? The variety of data sources (Variety). 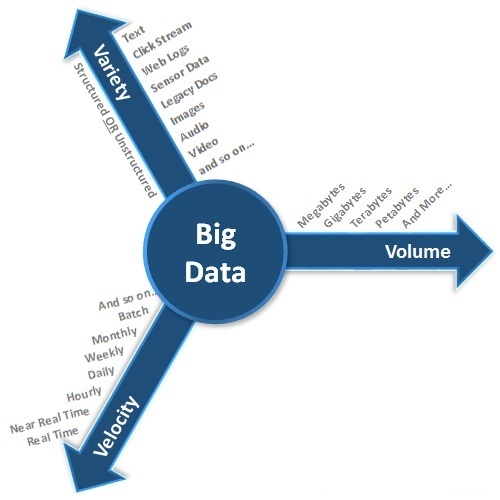 These are often called “three Vs” of Big Data. The first feature is volume, which refers to the total amount of data that is produced by the advanced technology in our everyday life en masse. In calendar year 2013, over two trillion bytes of data have been stored worldwide and about twenty million tweets published during Hurricane Sandy. Another feature is the processing speed. By the pronounced and electronic communications network, it has become possible, almost in “real time” to take the information to be received and processed. Thus, in the Japan Earthquake Tweets about 2000 were produced. The last important feature is the different texture. Big Data includes data of any kind, whether structured or unstructured is for further processing and analysis first it is irrelevant. Such data can occur, for example, in social networks, photos, videos, MP3 files, emails, tweets and on mobile devices. But the search engines or even the simple click sequence can be fermented to the new findings for the health or economics. When Big Data is about more than just an average size, it offers a variety of possibilities, the knowledge gained through analysis of new and the nascent data and the content types for the improvement of marketing methods, products or working conditions. The importance of Big Data in the economy has increased enormously. It is besides capital, resources and labor power has thought as the “fourth factor of production”. Recognition of interdependencies and automated hypotheses in science and research. Even the Civil Service plays the Big Data a major role, for example in traffic management. In Stockholm, the travel time was reduced by half by the inclusion of weather and traffic data. Also in the 2012 election campaign in the United States, the President Barack Obama applied Big Data. He created a team of 50 data analysts who were able to customize the information analysis from various sources, the election campaign for specific target groups and states more effectively. Scientific research builds where appropriate, from innovative data analysis. The importance of Big Data in the healthcare industry is now seen as “LARGE”. The goal of Big Data in medicine is make treatments more effective and to personalize, it has been possible by the data analysis of the risk factors of possible side effects and tolerability. According to the McKinsey Global Institute, the application of Big Data on the efficiency and quality improvement is 250 billion a year in Europe alone. Big Data analysis is based on the quality of the results from the connection of the various non-correlated data. 85% of the data were previously not technically be evaluated. The two new developments that are closely related to the big data analysis are Hadoop and MapReduce. In addition to the numerous benefits of Big Data for business, science and society and the dark part of this project should not be disregarded. The promise of the anonymization of data is not always followed. Certain details of the user like personal data automatically cancels anonymity,such example includes names, addresses and illnesses. Even more information can used for commercial and scientific purposes. Many analysts ask the question whether and to what extent the information from big data are useful and is representative. Through the use of Big Data of entrepreneurs in the future should not only know who, when and what product is purchased, but also why and what for, which can be directly incorporated into product development. Also in the health sector a major revolution can simplify many technical and organizational processes. Despite the numerous opportunities that big data is offering, they should be viewed with caution. The market for Big Data is young and undeveloped. There is lack of experience in dealing with Big Data. It lacks quality employees who can successfully build the business and the new technologies for the control of Big Data. But preparations for Big Data management need to be made today. Fast action is needed, it may be too late in a year already. The competition could qualitatively improve business model, create transparency and make work processes more effective and efficient. Thanks to Mohamed Ibrahim for the contribution on Google Plus. This article has content from Author’s original research work. This Article Has Been Shared 6719 Times! Cite this article as: Abhishek Ghosh, "Big Data : Current Applications and Research Topics," in The Customize Windows, March 4, 2014, April 26, 2019, https://thecustomizewindows.com/2014/03/big-data-current-applications-research-topics/.